Whether you are driving solo or with a full vehicle, safety is a concern rated right up there next to comfortability and performance. The 2018 Jeep Cherokee offers numerous safety features to give you peace of mind when driving to work or through Lubbock, NM. Learn more about a few of the numerous safety features from Stanley Chrysler Dodge Jeep Ram in Brownfield. This built-in system cues visual and audible warnings during unintentional lane drifts. If the driver does not respond LaneSense® actively corrects you. Using radar sensors, the Cherokee will detect whether it’s approaching another vehicle too fast giving an audible alert. Advanced brake assist may then kick in. Using dual radars, this system detects other vehicles entering into blind spot zones. If a vehicle is detected visual and audible cues will go off. An available 9-1-1 call button* summons emergency assistance immediately. The Assist button offers immediate access to Roadside Assistance*, for extra ease of mind. Why Buy from Stanley CDJR Brownfield? 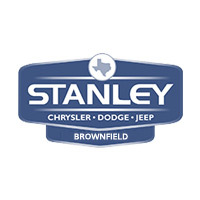 Stanley Chrysler Dodge Jeep Ram in Brownfield is here to help you in all your vehicle needs whether buying, financing, or servicing. We have a large inventory including numerous offers on the 2018 Jeep Cherokee. Our experienced and friendly staff is available six days a week to help take care of your vehicle while making sure you have a good experience. Contact us today if you have any questions! *This system is a driver’s convenience system, not a substitute for active driver involvement. The driver must remain aware of traffic conditions and maintain control of the vehicle. *This system is an alert system for the front of the vehicle. It is not a substitute for active driver involvement. The driver must remain aware of traffic conditions and be prepared to use brakes to avoid collisions. *The 9-1-1 Call button will connect you directly with Emergency Assistance. If you accidently press the button, you have 10 seconds to either cancel the call by pressing the 9-1-1 Call button on the rearview mirror or the cancel button on the Uconnect® touchscreen. *Provides direct dial access to Roadside Assistance Service. Vehicle must be within the United States, have network coverage and must be registered with Uconnect® Access with an active subscription that includes the applicable feature. Additional roadside assistance charges may apply. Check warranty for details.